The all-new, 100% composite MAKO® Pro Skiff 17 CC has been completely redesigned with wider beam, a bigger horsepower capacity and a striking new swept gunnel and graphics package! The Advanced Inverted V (AIV) hull has also been improved, providing the ultimate in smooth performance, plus a quick holeshot, a dry ride and nimble handling and turning. 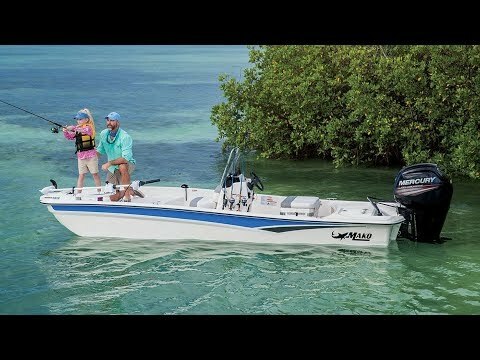 It's ideal for all types of inshore fishing, and it's nearly 3/4-ton capacity makes it one of the hardest working boats in its class. Length: 17 ft. 2.5 in. Beam: 6 ft. 11 in. Bottom width: 5 ft. 3 in. Max. person weight: 1000 lb. Transom height at center line: 20 in. Average hull weight: 950 lb. Average package weight: 2050 lb. Storage length: 22 ft. 4 in.